Just a human and a horse out for a stroll. The fourth and final expansion pack for Battlefield 1, Apocalypse, released last week. 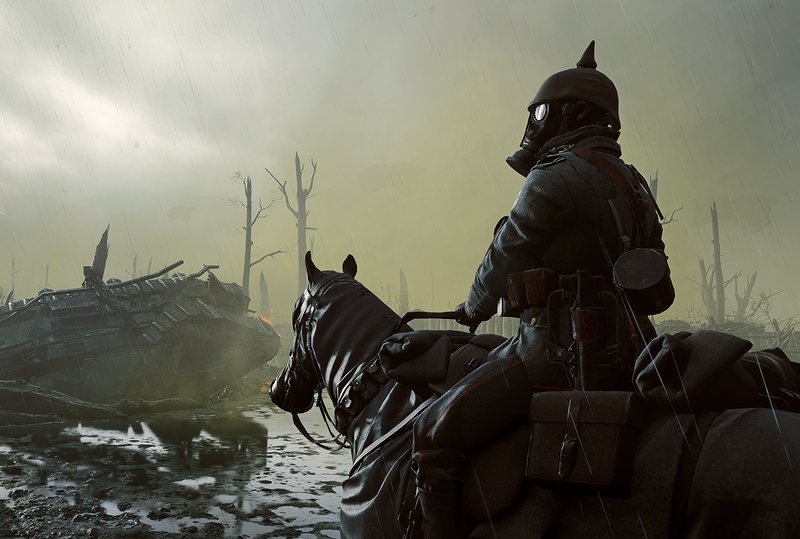 It leans into everything that Battlefield 1 has sold itself on since its release back in 2016: big maps, interesting historical and pseudo-historical weapons, and the general feeling that you will not make it out of this place alive. Like the previous DLC packs, Apocalypse introduces new maps and game modes to the mix that Battlefield 1 offers. The big outlier is the new Air Assault game mode, which puts every player in a plane so that they can fight for dominance for the skies. In the more traditional vein, there are three infantry maps, each one a unique articulation of the grist mill format that the Battlefield 1 team has so efficiently honed over the course of the game’s lifespan. To be completely candid, I haven’t even made the attempt to play the two maps in the Air Assault game mode. Flying planes so that I can attack and defeat other people flying in planes is not what I play Battlefield 1 for. I want the crunchy combined warfare of humans, tanks, and planes all entering into complicated scenarios with each other. While I’ve avoided Air Assault, I’ve put quite a few hours into the infantry maps of Apocalypse over the past few days, and I have some general impressions of them that I’m ready to share. Passchendaele looking like a legit ruin. Passchendaele is my favorite of the three. 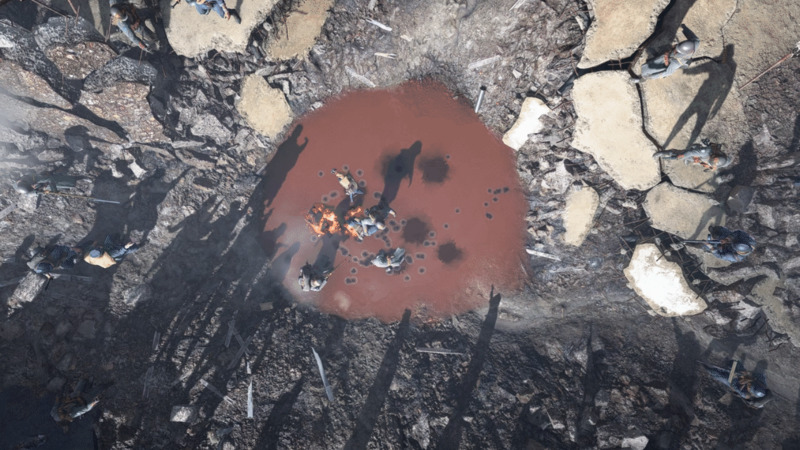 It takes place in a shelled-out nightmare world where poison gas and fire have warped everything into shades of sickly green and charred black. It is a traditional Conquest map, which means that two teams start on opposite ends of the arena and attempt to capture and contest points that will allow them to accrue points that allow them to win. In Passchendaele, that looks like huge swarms of people making their way from point to point and really slugging it out, constantly dying and (hopefully) being revived by teammates in the move toward victory. Some Battlefield 1 maps allow for you to play in a more elegant or tactical way. Galicia, Albion, and Fao Fortress are wide-open maps that have plenty of room for players to maneuver their way around, do sneaky covert operations, or snipe their enemies from across the world. Passchendaele isn’t one of those. It’s a brutal nightmare in the mode of Argonne Forest or Zeebrugge, and you’ve gotta fight tooth and nail for every inch of ground that your team gets. That windmill gets destroyed in the first ten minutes of every River Somme match. River Somme also nails this feeling. It’s a Conquest Assault map, which means that one team is invading the map and the other one is defending it. The defenders lack a “home base” spawn point, so if the invaders take all of the capture points, the defending team loses. This top-down design choice means that there are always clear lines of battle where each team knows exactly what is at stake in any given capture point gain and loss, which makes for some real dramatic moments in-game. Being on a great team doing the assaulting on River Somme is one of the better feelings in contemporary video games. You take the A point, rush across a shallow river to reach a windmill (B point) or a bunker with some trenches (C point), and then you storm across a wide No Man’s Land field up a gentle rise toward a trench-filled hill (D point). I can play this out exactly in my mind despite only playing the map a dozen times or so, and that speaks to the excellent level design being applied here. No one is ever fighting over this part of the map. It’s a shame the Caporetto, the third and final infantry map of Apocalypse, doesn’t have any of those feelings. It is also a Conquest Assault map, with the assaulting team emerging from a mountain pass and down a hill toward waiting enemies, but the critical difference is that there is no triumphant feel to that movement. As an attacking team, it is far too easy to be trapped in the rocky cover of the A point on the map, leaving the defending side to snipe, bomb, and mortar their way to victory. Caporetto seems to be designed to appease those players who love sniping and plane combat, as every pathway between points had wide-open places where it is difficult to find cover from enemy players who could be in any direction. Additionally, the path from the mountain pass has a steep slope, meaning that there is lots of cover but that it is hard to stand behind it optimally. It’s such a strange problem for a Battlefield 1 map to have, and it’s more pronounced here than it is in the much more vertical Monte Grappa map that launched with the game. I’ve been having a great time with the Apocalypse maps despite the obvious problems with Caporetto, and it’s my hope that they don’t wear out their welcome. I very quickly lost interest in the maps from the last expansion, Turning Tides, but I think that the land-oriented action of Apocalypse has the kind of staying power that will hold my interest longer, at least until we hear about what’s coming in the Battlefield series for the rest of 2018.